This is my first time working with Extreme Networks equipment so excuse any lack of knowledge I may have on these products. We have a C25 Controller running v09.12.01.0067 located at the Main Office with IP 172.20.1.25. We have 13 total AP-3825i AP's with 9 at the Main Office, and 2 at each Remote Office. The Main Office has a Microsoft DHCP server and the Remote Office's get their DHCP addresses from their respective WatchGuard firewalls. I installed the AP's at the Main Office and they connected up to the controller and are working beautifully! Because I couldn't add the Option 43 to the remote WatchGuard's, I connected the 4 Remote Office AP's to the Main Office network so they would obtain a DHCP address and configuration. Once the software was upgraded, I changed the IP's to manual IP's (172.20.2.x and 172.20.3.x) and set the controller IP as well. I installed the AP's at the Remote Office locations but they show up on the controller as Inactive Local AP's even though I can ping and SSH into each AP from the Main Office. I can also ping the controller from the Remote Office's. This tells me that they are being seen on the network but something is keeping them from connecting to the controller properly. Any idea's or suggestions is greatly appreciated! could you please set the controller log level to information as this might give us some hints what is going on, you could find the setting in > controller > logs > logs configuration > wireless controller log level. 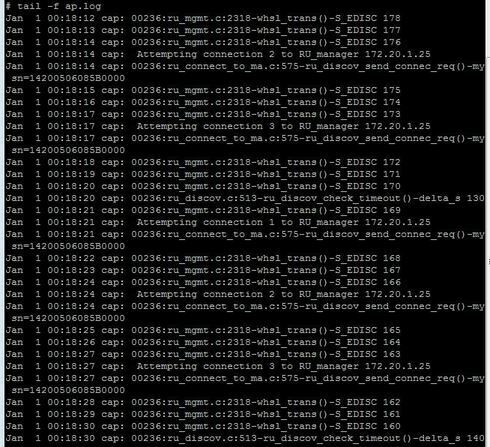 Then connect the remote AP again ... or reboot the AP via remote and let me know whether you get log messages in the log and which one. I think in your case that last one "Blacklist successfully sent..." is missing. In that case it's a MTU problem = the AP can't discover the MTU on the VPN link. Just set it in the static AP config to MTU=1300 - if the VPN uses a smaller value try it with a even smaller MTU. For even more detail what is going on you'd ssh to the AP and go in the /tmp/log directory. Then do a "tail -f ap.log" to see what the AP is trying to do. Also make sure the AP can talk to the controller on UDP port 13910. That is the port that the APs use to connect to the controller. As for discovery you can add an a record in your DNS for "controller" and point it at your controller. The APs will query DNS for that you won't have to set it statically. The APs will look for the DHCP option first and then do a DNS lookup for "controller" and then do multicast to try and find the mother ship. Not positive on the order but I think that is it. You can log into your AP to see what is going on. You can do a "cget config global" to get the settings on your AP. Default login for your APs should be admin and new2day. You could also log into your controller and do a tcpdump and filter out for any traffic from your AP to see what is making it to your AP. Let me know if you need help doing that. My guess is that your firewall is blocking UDP 13910 and not allowing the tunnel traffic through. cat /home/config/current.cfg | grep "cset auth"
As you'd see my AP try to connect to my controller/RUmanager = 20.20.20.20 all the time. Thanks Ron and John for the replies! I set the controller log level to information and restarted one of the remote AP's which resulted in nothing being logged. I then restarted one of the local AP's and I received entries like those in your screenshot. Our firewalls are managed by a 3rd party and I requested that UDP port 13910 be allowed. During discussion with the 3rd party, we've discovered that the 3 clinic firewalls are receiving DHCP addresses from our ISP instead of having static ones assigned. Because of this, they won't open the port until we get static IP's assigned to the firewalls which I'm currently working on. Once that's accomplished, then I'll be able to see if UDP port 13910 will resolve it. Is there anything in the AP log or config that jumps out? Thanks again for taking the time to look at this! The log on the AP doesn't mean much to me. Can you ping the controller from the AP? If yes do you see any UDP traffic hitting your controller from the AP? You can ssh into the controller and do a tcpdump to find out. Once you login you are in the CLI for the wireless management for the controller. To get to the Linux kernel you have to type 'shell' and submit your admin password again. Once there you can do an ifconfig to find out the interface name of your management address. For me it is csi1. 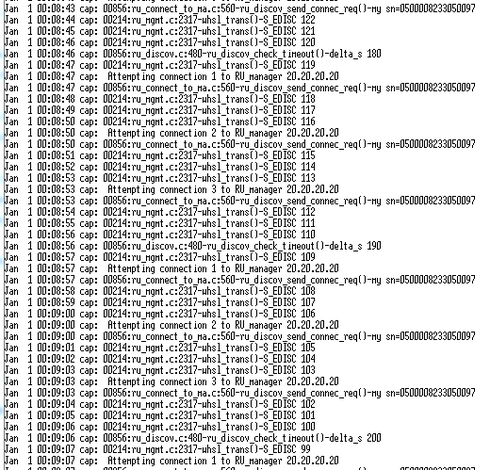 So I do a tcpdump -i csi1 -w mypcapfile.pcap and then boot up your AP. Let that run for a few minutes then FTP that file off of the server and get it onto a box with Wireshark. Then in Wireshark do a filter for the IP address of your AP and see what you get. It will tell you if the AP is connecting via TCP but not UDP or if it is not connecting at all etc. It will help you when dealing with the 3rd party because you will know exactly what the issue is. I don't see the logic behind not allowing UDP 13910 if you are getting a DHCP address from the ISP. Your tunnel is either secure or it is not and opening UDP 13910 from your AP to the wireless controller is not going to bring down your network. Sounds to me like they just want you to have a static IP because it is easier to manage a VPN that way. John...I agree, they are difficult to deal with and the static IP is just an excuse. I'll get wire shark loaded up this weekend and I'll run what you suggested. The controller is still showing the AP as inactive. If the status is pending select the AP and hit approve. Then either wait 5minutes (every 5 minutes the AP restarts the discovery) or reboot the AP. Ron...I checked the Access Approval screen and they all show as being approved. John...How do you FTP the file from the controller? Is there a port other that 21 to use? I tried both IP's. Give me a call. . I'd be happy to help. I just wanted to post the resolution that solved my issue. First I had to add the .2.x and .3.x networks in the routing table which allowed the controller to see the access points but then I needed to reduce the MTU to 1300 for them to establish a tunnel and begin working. Big thanks to Ron and John as with their assistance, I've learned much more about how the Extreme wireless products work. Could someone explain what does this log mean? Jan 1 00:04:31 cap: 00217:ru_mgmt.c:2838-handle_discov_pkts()-Could not send pkb to RU_DISC thread! Hello Abdullah, I would suggest contacting the GTAC so they can open a ticket and review your current settings/configurations. There are many reasons why this can occur. It's hard to say without reviewing the configurations you are using. That's why I suggested to contact the GTAC. This forum is not the best place for troubleshooting performance issues. If you would like to review a list of past or known issues you can search https://gtacknowledge.extremenetworks.com for the word performance. Be sure to select the Extreme Software Type: IdentiFi Wireless. Sure please email support@extremenetworks.com, in the subject line use [wireless] only (include the brackets) and send in your information. Please include the link to this hub conversation in the body of the email.